Susan's new book is only a month or so away, and she's making plans for her tour through Texas, Oklahoma, Kansas, Arizona, New Mexico, and Colorado. While she's getting packed, Peggy (our webmaster-beyond-compare) has posted a page of information about the book here. You can read the first chapter there, too. Actually, I'm still pretty ambivalent about what happened in that case. I'm glad it all got sorted out in the end (well, most of it, anyway). But Ruby had a very hard time of it. And I'm sure that Sheila (that's Sheila Dawson, our esteemed chief of police) didn't appreciate my meddling in the case. But that was in the beginning. In the end, I think she was glad to have the help--especially when Rambo pitched in to lend a hand. No, make that a paw. A big paw. But if I go on, there won't be any mystery, so I'd better stop. If you want to read the book, you know where to find it. 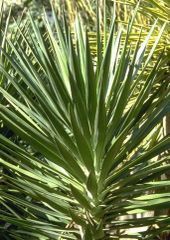 In the meantime, I can at least tell you a little about the signature herb of the book, yucca. Susan borrowed one of its folknames, Spanish dagger, for the title of her book. If you think of yucca as a plant that grows only in the southwestern deserts, you'd be wrong. This spiky plant, which belongs to the genus Agave, has an enormous distribution, ranging from the Atlantic (Yucca filamentosa) westward to the Pacific (Y. whipplei) and from Canada (Y. glacua ssp. albertana) south into Guatemala (Y. elephantipes). There are some fifty species native to the United States and thirty more to Mexico and Central America, some tall, some short, and all with that star-burst of sharp, spiny leaf-tips, sometimes at the base of the plant, sometimes near the top of the stalk. So if you're looking for yucca, you'll probably find a native in your neighborhood. And where it's not native--the Atlantic northeast and the Pacific northwest--it has escaped from people's gardens and hightailed it for the wilderness. So you're likely to find it growing there, too. Yuccas lead an interesting life. They require a specific moth for pollination, and if the right moth isn't hanging around in the neighborhood, the blooms won't produce any fruit. Exclusive company, huh? I'll be posting more about yuccas over the next few weeks, including some really neat information about the various uses of yucca. So check in on Mondays. And in the meantime, don't forget about that first chapter. It's here. We thoroughly enjoyed your visit to The Woodlands. It was a delight to be able to spend some time at Camille's and dinner with you. I believe woodruf is used to make May wine. It could be an herb for the winery book! However, I'm not sure it can be grown in Texas!